Villa Vjeka is situated in the west part of the picturesque village of Sumartin on Brac. It is a traditional Dalmatian stone house, which was renovated in 2011 and furnished with authentic period furniture. The upper floor has 3 bedrooms, 2 bathrooms, 2 balconies and a furnished large terrace with stunning sea views. To make your stay on Brac Island as pleasant as possible, we have equipped the villa with all the equipment you might need. All the accommodation in our range must have that special something which best reflects the place it is in. We choose our accommodation with great care, because we want it to stand out in a crowd of alternatives. All the accommodation in the Orvas Hotels range must have that special something which best reflects the place it is in. We choose our accommodation with great care, because we want it to stand out in a crowd of alternatives. 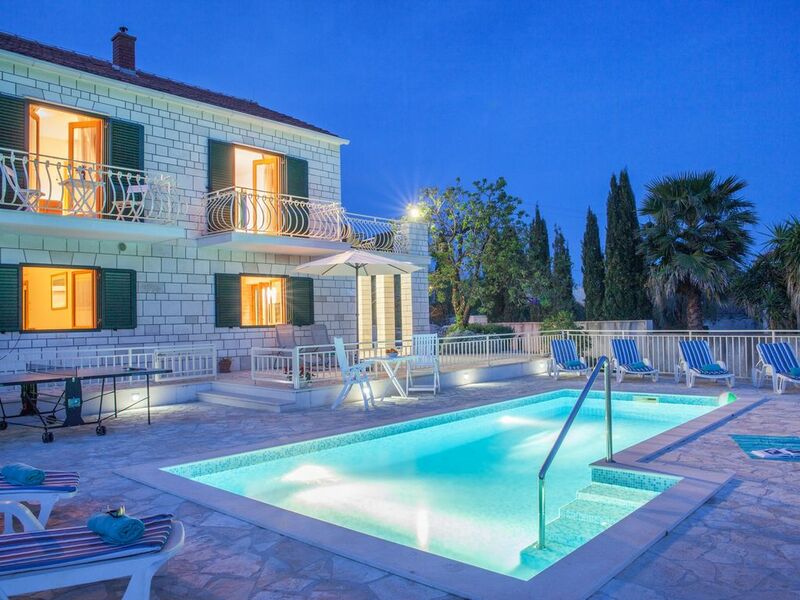 Villa Vjeka offers comfort and warmth of the traditional Dalmatian stone villa. The stunning sea views are inspiring. The picturesque Sumartin is still a peaceful place to spend a restful holiday. There are some quiet, hidden coves nearby with sandy or pebble beaches. Sumartin is attractive because it has retained its simplicity, with its lovely beaches, unspoiled nature and crystal clear sea. You can always find fresh fish and other local delicacies, like cheese, honey, lamb and wine. If you want entertainment, you can always go to Bol, one of the best-known Adriatic destinations with a vibrant nightlife and a wide range of sporting activities. Bathroom 1 with bath. Bathroom 2 with bath. Bathroom 3 with shower. Separate WC. Kitchen / dining room / living room, air-conditioning, satellite TV, Hi-fi, DVD player, home cinema. Kitchen with 4-ring ceramic hob, oven, refrigerator, freezer, dishwasher, toaster, hood, coffee filter machine, microwave oven, mixer and kettle. Notes on accommodation: Air-conditioning. Maid (non resident). Outside: Beautiful garden with sea views. Surface area of villa 150sq.m. Surface area of grounds 1700sq.m. Outdoor private swimming pool of 25sq.m (fresh water). Outdoor fireplace, garden furniture, dining area. Cleaning / Towels / Linen / Maid service: Towels and linen are included. Paid cleaning frequency: final cleaning. Extra cleaning costs 80 euros. Other: Washing machine, hair dryer, iron, ironing board, Internet connection. We had a great time at Villa Vjeka. Beautiful, well equipped house and Sumartin is a perfect calm village with a few restaurants and small beaches. Advantages of the location: sea 50m. Beach 50m. The nearest international airport - Split airport (Resnik). Split airport is 30km distant from Split port (shuffle bus, rent a car, taxi). From Split port take the ferry to Supetar 45 minutes drive (take the modern tarmac road from Supetar to Sumartin on Brac (about 39km) - bus, rent a car, taxi. If you are coming from Makarska area take the direct catamaran line to Sumartin on Brac. Use of car recommended. Town centre 100m. Grocery shop 100m. Pharmacy 3000m. Clinic 3000m. Bureau de change 100m. Petrol station 1500m. Bus stop 100m. Please contact us if you need: rent a car, rent a scooter, rent a boat, transfers, taxi services. - Sea Kayaking - explore hidden bays, beaches and small picturesque villages. - Windsurfing - spend a day learning how to windsurf and enjoy this perfect summer activity. - Sailing - spend a day aboard learning and enjoying. - Diving - duration: 1 hour. - Diving school - Duration: 10 hours (theory) and 12 hours (practical part). - Fishing - for 4-7 people. - Climbing day - spend a day rock climbing at spectacular Brac locations. - Wine tasting- wine tasting with us is truly an authentic experience. - Visit to Blaca Hermitage - there is no better way to learn about the nature, history and traditions of Brac than walking with our guides. - Biking - Duration:3-4 hrs. - Split tour - from Bol to Sumartin, Pucisca or Milna to Split and back. Price: 700 EUR (up to 4 persons) 900 EUR (max.8 persons). Note: Prices may vary depending on season. SPECIAL OFFER: 25% DISCOUNT FOR RENTAL PERIODS IN JULY (3 NIGHTS MINIMUM STAY) - INCLUDED IN PRICES. Booking Notes: Please send us your request (email, fax) and state the exact rental period, number and age of the guests. We shall reply and send you an offer. The villa can be put on hold for 48 hours in order to give you time to confirm the reservation. Timing of payment: 50% when confirming reservation, 50% 35 days prior to arrival. After each payment we shall send you the confirmation of payment. Security deposit (upon arrival): credit card authorization for the sum of 500 euros. Changeover Day: Preferred day of arrival: Saturday or Sunday in July and August; for other periods, please inquire. Check in from 4 pm. Check out by 10am. Notes on prices: Prices are for the property per night in euros. Tourist tax not included in prices (about 1 euro per person per day). Security deposit on arrival: 500 euros (credit card authorisation).